My six-year old son rides his bicycle with me to school and to many other places. We ride on the pavement to school, and many people think that this is a safe solution. However, every day I constantly need to teach him the dangers of cars reversing out of driveways. Many motorists are unprepared for a bicycle travelling faster than a pedestrian, and the danger is considerable and real. Add to this the carelessness of the person hastening off to work in morning rush hour and you have a great risk to children. Many cyclists advocating for bicycle infrastructure consider the battle won when on-road routes are put in place. However, although the route to Bankstown from Merrylands is okay for me to ride, there was more than one heart-stopping moment with my son. Even off-road bicycle paths that cross major roads are major hazards to children. Crossing a road while pushing two bicycles and holding onto my son is also a difficult and dangerous operation. The issue of conflict crossings is more pressing with children. 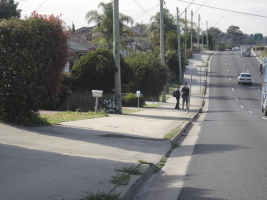 As the photograph shows, many off-road bicycle paths are crossed by many blind driveways. Bicycle path designs must take children's needs into account if it is hoped that child cyclists can grow up into adult cyclists. Part of the trip to school involves going over the Duck River bridge on Mona Street. A few weeks ago, my son was riding on the pavement over the bridge, when his handlebar clipped the concrete railing, and he fell over — right onto the narrow busy roadway! In a flash, I threw down my bike and jumped onto the road between him and the traffic, then looked up to see what was coming at us. The small van just managed to break before hitting me, and the string of cars close behind luckily avoided running into the rear of the van. My heart was thumping faster than I remember before as I lifted my son off the road back onto the footpath. We always walk across the bridge now. But I still see many other children ride their bicycles over the path, and I pray that none clip the hand rail as they go over. People who are not parents often fail to appreciate the needs of children who ride bicycles. Riding on the pavement is not a satisfactory solution. Off road bicycle paths that avoid busy road crossings are important for the survival of child cyclists. My son spends many hours per week exposed to the dangers of riding on the footpath, depending on the reversing motorists to look a little further up the pavement, round the high fences along their driveways. Crossings such as the pavement on the bridge over Mona Street are deadly to children, and a safer way of crossing the river should be a high priority, particularly since two bicycle paths start at opposite sides of the river at that location. Cycling for children should not be so much of a hit and miss affair.